Every morning, the fine folks at Sports Radio Interviews sift through the a.m. drive-time chatter to bring you the best interviews with coaches, players, and personalities across the sports landscape. Today: Doug O'Neill and I'll Have Another have some secrets heading to Belmont. Doug O'Neill joined The Dan Patrick Show to discuss where I'll Have Another is now, talking to his horse, if he thinks the horse knows how good he is, the importance of a horse's personality, the stretch run at the Preakness, the plan for the next couple weeks and if the layoff could be a bad thing. "I'll Have Another is in New York. He's in the barn area at Belmont Park. … He's settled into New York and loving it." "Oh it's on a daily basis. Yesterday we talked at length and he was very happy with the royal treatment the people in Baltimore gave him." What did you say to him right after he won the Preakness? : "I'm saying, ‘You are an absolute stud. Do you realize what you just did, I'll Have Another? That was unbelievable. … A lot of that stuff we like to keep private, kind of keep it in the locker room because I don't want horses like Union Rags hearing our conversation." "I think he does. They all have different personalities. That's the beauty of these horses. 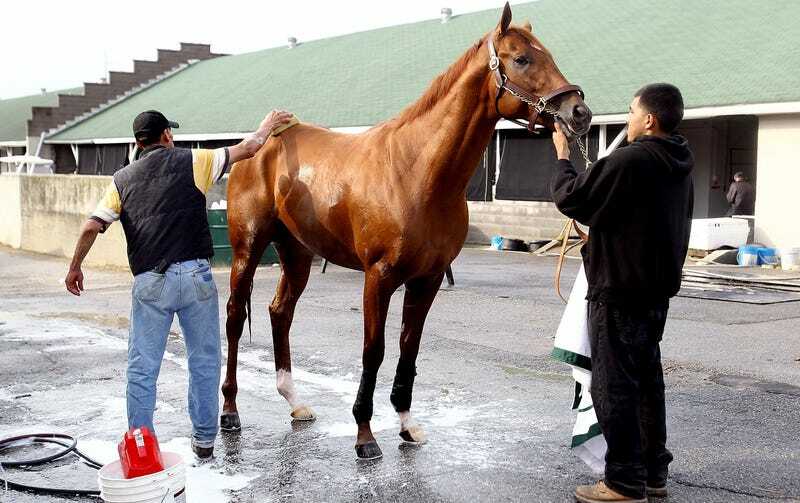 You have some that just thrive on all the attention and you look at Churchill Downs and Pimlico the other day, the crowds and the excitement and the energy in the air. The average horse, in the morning when no one's looking, they love the game, but you put all that pressure on and they shrivel up a little bit. Horses like I'll Have Another, there are not too many of them. They just thrive on the game, thrive on the attention. I thought we were going to run out of real estate down the lane, but he knew where the wire was and got there." "It's huge. One of the huge perks of winning the Kentucky Derby, we got a chance to go to the Ravens' camp and I got a chance to have a short little lunch there with Coach Harbaugh. He was talking about that. It was rookie camp and how all these guys are absolute studs in college and how when they get to where he is, how many of them kind of get anxious, get nervous and are dropping balls, and how some of them are just so natural and thrive on it. It's such a key component to having a tough race horse, they have to have a real confident mind." "I'm thinking we're going to run second. It's going to be such a bummer to win the Derby and run second in the Preakness. It was such a roller coaster because top of the lane I thought we were going to win, mid-stretch I thought we were going to run second and then I could tell, at the end there, he was just gobbling up the ground. I was just hoping the wire didn't come up too soon and Mario just timed it absolutely perfectly. It's hard to put into words that feeling of all the hard work that goes into it. To get there was just incredible." "We got to know folks in Louisville and especially folks in Baltimore. We just got a chance to meet so many cool people. So many people love horses, love horse racing, but don't know a lot about it. In my own little way, we've got an awesome crew of guys who have been able to share kind of behind the scenes and backstage of what goes on in this beautiful game. I'd love to do that in New York as well. And a lot of it, enjoying these cities as we go, it depends on how I'll Have Another is doing. He was doing so well in those last two cities." "No, it's like every other sport. You've just got to dodge the injury bug. As long as we stay injury-free and he continues to train well, it's going to be nothing but positive." • Jacob Tamme says Peyton looks like the Peyton of old. • Mike Miller says the Heat won't panic yet. • Philip Rivers wouldn't mind having LaDainian Tomlinson back.